Here is another Freebie for you, a tuneup Utility called Advanced SystemCare PRO from Iobit. Thanks to Mike for tipping us about this. This offer is brought to you thanks to a promo by PC Advisor. Advanced SystemCare Pro provides an always-on, automated, all-in-one PC Healthcare Service with anti-spyware, privacy protection, performance tune-ups, and system cleaning capabilities. Whatever version of Windows youâ€™re running, enjoy that â€œgood as newâ€ speed usually only experienced on a brand new PC. Boosts your systemâ€™s performance by cleaning missing files, destroying unwanted files, deleting obsolete files, and removing junk files. Supports clean-up of over 50 different types of junk files. Detects and analyzes Windows security environment. Scans and removes spyware and adware using up-to-date definition files. Prevents spyware, hackers and hijackers from installing malicious programs on your computer. Erases and updates your PCâ€™s activity histories. 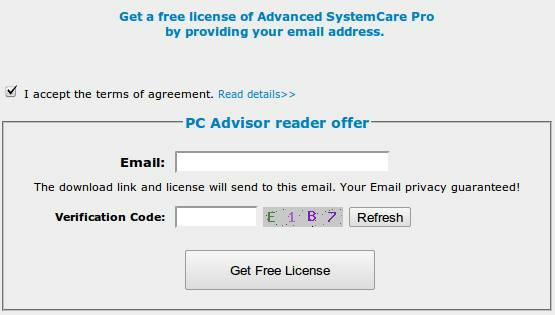 Get a free license of Advanced SystemCare Pro just by providing your email address. PS: As you can see, I am still to test this product and hence I am not writing about how it fares till I do a testing or review it later on. You guys may share your feedback in comments here. Thanks, for this unlike to some soft iobit advanced system care pro gets frequent updates, this is good to maintain the soft reliability. I have been using Iobit Advance System Care pro for a while, it is quite good. Cleans up junk files and registry pretty quickly and safely. Defrag is a bit slow, (if you have many files). I suggest Iobit Smart defrag instead of the built-in one. Smart defrag is a free product from Iobit. The only thing I didnt like is, it enabled Windows update automatically. Thank you Ashwin for sharing the feedback about System care.